There’s a reason the typical commercial real estate agent salary is six figures. The learning curve to become a commercial agent is six months to six years and comes with an expectation of increased education, said Thomas Riley, a New Hampshire commercial agent at www.thomasariley.net and treasurer of the National Association of Realtors (NAR). “The training is intense,” Riley said. Commercial agents are expected to know about many more aspects of real estate than residential agents and may specialize in several areas, such as office, retail, and industrial development, he said. With the higher demands for education and training, commercial real estate agents can expect to earn more than twice what residential agents earn. Commercial agents had a median annual gross income of $108,800 last year, according to the 2017 NAR Commercial Member Profile. Commercial brokers tend to have higher incomes than agents, but there are more NAR commercial agents, 31 percent, than brokers, 17 percent. Income increased with experience and work hours, the NAR profile showed. Those with less than two years of experience had median annual incomes of $43,400 last year compared to those with more than 26 years of experience, $165,400. Although Riley has 35 years of experience, most commercial real estate agents have been in business 24 years and in commercial real estate 19 years. Shan Zaidi, a commercial broker in Texas, has been in the business for six years, at it full-time for the past three. 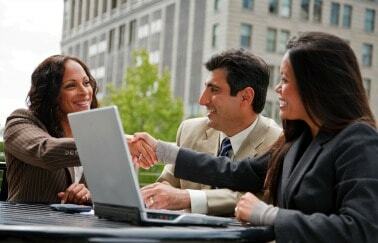 Working part-time is rare among commercial agents. The majority NAR surveyed worked at least 40 hours a week. Agents who worked less than 20 hours reported a median annual income of $21,600 and those who worked 60 hours or more, $163,200. Agents with six to 15 years of experience tend to work longer hours than those with less than two years of experience and those with 26 years or more. Zaidi said his background in investments, acquisitions, management consulting, and as an analyst helps him as a commercial broker, he said. Finance and marketing degrees are also valuable because the job requires an understanding of underwriting, lending, tax ramifications, and the ability to communicate effectively with the buyer and seller. Sixty-eight percent of commercial agents have a bachelors degree or higher. Riley recommended that commercial agents start in the residential real estate field and learn sales, business, people, and communication skills. In our recent salary survey, we discovered that specialization pays off. (Data in this report is from a survey conducted in February 2018 that generated 1,029 responses from licensed real estate professionals in the United States. The study has a 5% margin of error at a 99% confidence level. All survey participants have taken a course with Real Estate Express’ sister company, McKissock Learning.) As people enter the real estate profession, they usually pick an area or two to grow their expertise. 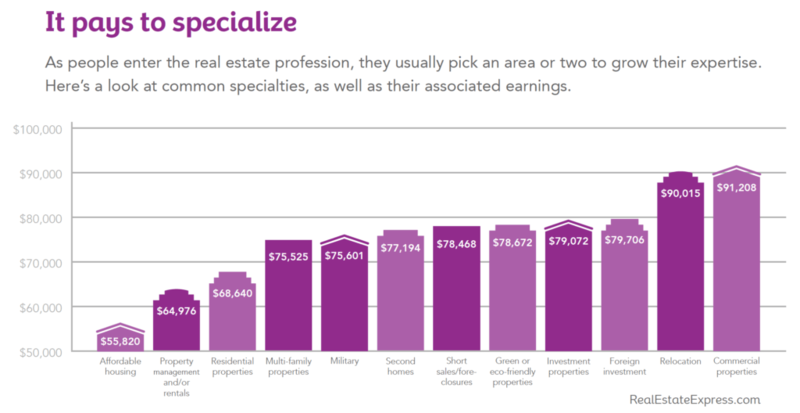 This chart shows common specialties, as well as their associated earnings – including that of commercial agents. Unlike residential real estate agents, who may run multiple listings and show properties every weekend, commercial agents tend to focus on a few deals for several months, Zaidi said. Commercial real estate deals tend to be larger than residential deals and take longer to close. One or two multi-million-dollar commercial deals every year or so can provide enough income for several years, he said. In 2016, commercial NAR members reported a median of eight transactions. Among members surveyed, 26 percent reported having one to four transactions, and 30 percent reported having more than 20 transactions last year. The median sales transaction volume was $3.5 million, and the median dollar value of sales transactions was $541,700. The median lease transaction volume among members who reported at least one transaction was $600,000. The median leasing value, $221,200. Most commercial members are paid on commission, according to the NAR report. Almost half of those surveyed were compensated through a percentage of commission split between the sales/leasing representative and the broker or broker’s office. Riley says those who work with a real estate brokerage may receive straight commission or a stipend toward commission to start. Those who work in-house for large enterprises may be given a commercial real estate agent salary and commission, he said. The majority of commercial real estate professionals are male and earn more, $129,200, than females, $81,300. Riley said he expects the dichotomy to change as more women enter the commercial real estate field. Most members also earned some personal income from commercial real estate investments, NAR reported. Some of the challenges of the commercial real estate job today include pricing issues and fluctuating interest rates. The value of the property drops as interest rates rise, which can cause deals to fall through, Zaidi said.